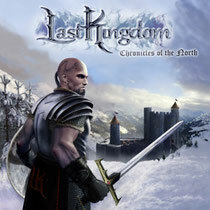 The Swedish band LAST KINGDOM from Gothenburg has released the debut album "Chronicles Of The North" from Limb Music on March 9, 2012. This is a solid, often driving Melodic Metal Album with symphonic parts and compact melodies in keeping with their style. Their music combines driving, melodic Power Metal components with symphonic keyboards, pleasing and multi-faceted vocals without relegating the most important weapon in the heavy metal artillery, the guitar, to the background. The proximity to understandable melodies is a hugely important aspect for LAST KINGDOM and they do not lose sight of this in any of the nine songs on the album.